For a long time, I was (and still am at times) deeply afraid of my past. I was incredibly sensitive to the criticisms from my mom. She yelled at me on a regular basis. Why wasn’t I better? What was wrong with me? Why couldn’t I have perfect Chinese calligraphy? I was the only child. She gave up a lot for me, and I perceived at times, she deeply resented me. Those childhood memories still drive a lot of my reactions. My mother’s reactions became my reactions. Her criticality became mine. I became judgmental of everyone I met, and for those on the road, judgmental of the way they drove. I wrote stories about these drivers I never even met in my head, generally towards the negative. But I was better than them, and they were in my way, impeding my progress. I felt incredibly shamed and guilty that I felt that way about my fellow species. I created anxiety when I didn’t arrive at a certain place at the time I felt I should have arrived there. 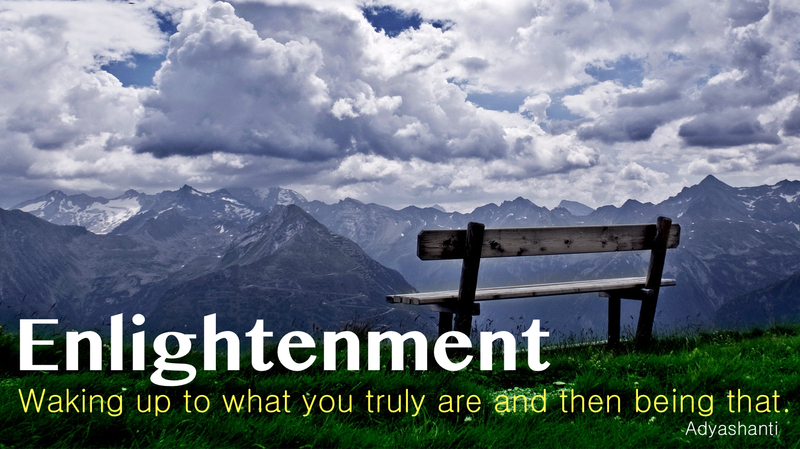 This applied to not only driving, but my career as well, to which I derived a lot of my self-worth. Finally, recently though, I started to wake up. I became tired of the anxiety and depression that would come in waves, ebb and flow. To date, I have spent thousands on therapy, many hours meditating and doing yoga, but only have finally started to wake up. Often, the hardest mirror to peer into is the one our mother holds up for us. My mom came to help out when my 8-month old son was not sleeping through the night in January. I couldn’t handle the lack of sleep, and needing to perform at my job, and negative self-talk, being away from the house from 6:30 am to 7 pm and–well there are a lot of and’s. Needless to say, I thought that having my mom over for about 8 weeks would be enough to bridge the gap and get me through the tough spot. At the end of the day, she lasted 6 weeks and boarded an airplane, and went back home in a different state. During this time, I saw things transpire in my 4-year old daughter that hit close to home. Actually, I mean at home. My daughter started showing signs of depression–crying, and a lot more crying than was doing. She felt abandoned–my mom was taking care of my son, and my husband and I were too tired to do too much with her after we came home from work during this period. She wet her pants three times a week. But during the weekends, my mom would constantly harangue at my daughter to do her homework. She consistently criticized my husband and I on why we weren’t reading more to her. It was never enough for my mom. But she didn’t propose any solutions. The mirror was being held up, and it was eerily similar. I did not want my daughter to suffer the same fate that I had. 1. Bring in the right resources. Our regular babysitter was busy the fall semester, but I didn’t think to call her for her spring semester schedule. She was available! Katie introduced me to Sonya Ware for life/executive coaching. Sonya introduced me to a great new therapist who kept me accountable. Don’t make a decision in the heat of the moment and bring in the wrong people to help you when you need it most. 2. Be present to win. Worrying about the past or future causes a lot of anxiety. Unless I am actively working on a challenge, I stopped worrying. I let my subconscious stew about it instead. 3. Allocate enough time to prepare–put it in the schedule and guard it like a meeting. I am always preparing for something--a presentation, getting into the right mindset after work to pick up my kids and be positive–preparation is key to excellent execution. I have times on weekends and certain days of the week to read to my daughter and help her with homework now. 4. Be open to the experiences the universe will give you. Every experience, no matter your reaction, offers an experience to learn and to grow. 5. Attach self-worth to something intransient I am still working on this one. I try to remember that this is a journey, and whatever progress I make towards knowing that I am worthy, that I fully accept my successes and failures–that is what matters. As long as I am making some small progress (recorded each day in Evernote!) on this, I am successful that day. Belated agreement with Katie…you rock Islin. Thank you for sharing. 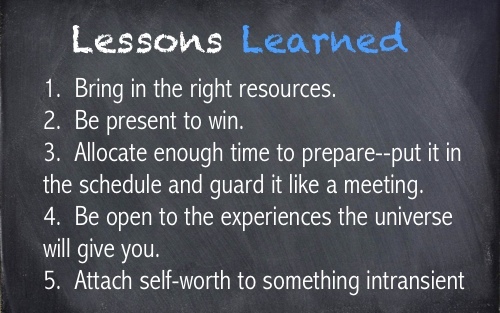 (I am also printing out your Lessons Learned image and taping it in a safe place near my desk). Just so you know, a year later, this is still a fresh piece for someone reading it for the first time. You are spot on! Thank you!